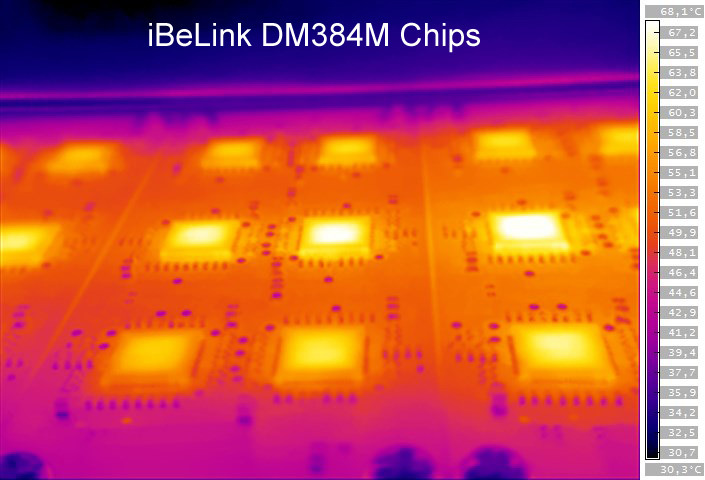 Time for a bit more in-depth look at the operating temperatures of the iBeLink DM384M X11 ASIC with the help of a thermal imaging camera. We are starting with the front and rear of the case that the mining ASIC uses, the front has four powerful Delta Electronics server fans that such cold air through the whole case where the mining blades are and the hot air exits directly through the back of the case. There are no other fans at the back, just open space for the hot air to exit the case of the device effectively cooling. The only other fan is the one of the server grade power supply that is mounted inside the case, another server grade Delta Electronics fan that is also powerful and noisy when in operation. The fans do not have power control, so they operate at maximum RPM all of the time making the device quite noisy, but also effectively cooled even in no so cool environment. The four blades with ASIC chips are located on the side of the cooling fans and on the other side of the case is the power supply with the Raspberry Pi controller mounted over it. The side with the RPi and the power supply is pretty cold compared to the side where the four blade with 48 chips each are located. As one might expect the hottest part inside the miner are the ASIC chips, the rest remains pretty cold thanks to the high airflow provided by the cooling fans. Even the heatsink that are on the back of the PCB with the chips remain pretty cool thanks to the high airflow passing through them. And now let us take a look at the chips themselves as the hottest element of the iBeLink DM384M X11 ASIC miners. Under the stock operating conditions they do remain with a surface temperature range of about 60-68 degrees Celsius as the temperature varies slightly depending on their position on the blade. As we’ve said already the cooling heatsink is not placed on top of the chips themselves, but instead is on the back of the PCB. This is the easier way to make things work, but not the most efficient for cooling as the chips use the PCB as a large heatspreader that then passes the heat to the large heatsink. This results in higher operating temperatures of the ASIC chips as there is no direct contact, but the temperatures are still Ok for normal operation. You should however be careful should you decide to overclock in order to get some extra hashrate as this will increase the operating temperatures of the chips. It seems that iBeLink has already chosen the optimal operating frequency for the device that results in very little HW errors while providing optimum performance. Further increasing the PLL frequency over the stock 110 MHz even with just a few Megahertz may result in increased percentage of HW errors. As we have already shared with you recently there were news of a X11 ASIC miner, namely the iBeLink DM384M ASIC DASH Miner some days ago and we were among the first to pre-order a unit in order to confirm it is indeed real and to test it out. This week we have received our iBeLink DM384M miner and we can confirm it is real and it is also time to share some photos of our unit and first impressions form the hardware. We want to start with the fact that we are in no way associated with Dual Miner who were selling the device or the Tiannengbo Group who are making the hardware, we have purchased the device as a regular customer and have paid the normal price. The total price of the iBeLink DM384M X11 ASIC miner was the $2098 USD stated on Dual Miner’s website + extra $157 USD for the shipping and then 20% VAT when it arrived from China + some extra fee for the courier company to get it cleared from the customs. The total cost of the device delivered to our door was $2726 USD with everything included that we have paid to get it. We are very happy with the service provided by Dual Miner, though they may be a bit slow in email communication at times, they do their job well and deliver on their promises… it is a shame that they do not have a larger product catalog offering more mining hardware options. Moving to the device itself, it was very well packaged and the box was not as big as we have anticipated actually. What we got is the miner itself plus a power cable with a US power connector, even though the unit was shipped to Europe and there was no manual inside (download the manual online in PDF format). iBeLink DM384M X11 ASIC miner we got is very much like on the first published photos, so the initial images were not from some prototype, but from the actual device that was shipped to customers. 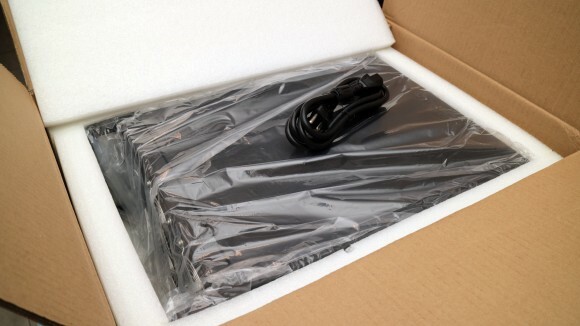 The build quality is quite good, the case is sturdy and everything is well fitted and bolted inside, so even after getting it shipped from China everything was fine and there were no fallen screws or disconnected cables during the transportation. It all feels like a solid product designed to last long and hopefully it will be able to even though this seems to be the first generation of X11 ASIC miners and we are probably going to soon see more efficient and even faster solutions becoming available. There are already some news for competition with higher hashrate and lower power consumption, however we can not confirm if there is actually other working X11 ASIC hardware or not yet. We can only confirm that the iBeLink DM384M X11 ASIC miner is real and works as we have actual hardware in our hands and are already using it for mining. We are going to share more details about it very soon, so stay tuned for additional feedback about the device as we continue to test it, details about power consumption, heat, overclocking, optimizations and so on are coming soon. iBeLink DM384M consists of four blades with 192 TNB0301 ASIC chips total and the device is supposed to be able to provide about 384 MHS hashrate at about 715 Watts power consumption at the wall. 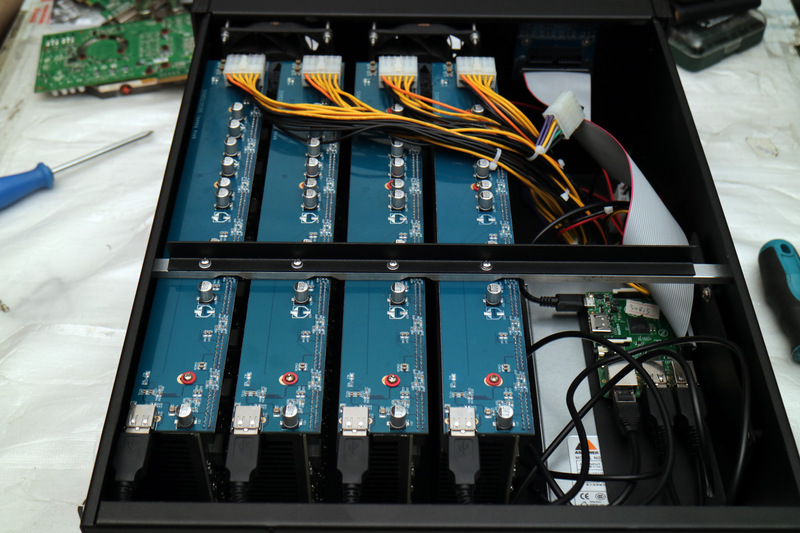 The four blades with chips are being controlled by a Raspberry Pi that also provides the user with an easy graphical interface to the cgminer software (the unit is being shipped with version 3.5.5) that is used for the mining process. The four blades are connected via USB ports to the RPi and the network interface of the RPi is used to be connected to your network in order to setup and control the miner. No need to have it connected to a standalone computer to control the mining process, everything is being done by the device thanks to the Raspberry Pi inside, all you have to do is connect the power and network cables and you are ready to configure it and start mining. The power supply built into the unit is an 850 Watts one, so with a power consumption of around 700 W it should be able to handle some more overclock if the miner is capable of such, we are going to be trying this out soon as well. The cooling of the ASIC chips is ensured by four Delta fans (server grade), so it is not very silent when in operation, even though the air exiting the case of the miner does not feel very hot. There seems to be no temperature sensor and fan control available, to reduce the noise if the operating temperatures are lower, so definitely the miner is not suitable to be used in a room where people are present more of the time as it is pretty noisy. Here is how a single blade looks like with the 48 TNB0301 ASIC chips on it. The cooling heatsink is not placed on top of the mining chips, but is instead on the back side and it uses the PCB to transfer the heat of the chips to the heatsink. This is the easier way to do the cooling when the chips are not getting way too hot as we’ve seen from other ASIC miners in the past.